Psalm 37:30 The mouths of the righteous utter wisdom, and their tongues speak what is just. I was so proud of our pupils and teachers on Thursday, when we had two advisers from Havering School Improvement Services visiting the school. They confirmed that all of our children are receiving a good education and that our pupils are polite, well-behaved and very good at talking about their learning. I am sure that you are just as proud of your children as we are. Tiptoe Through the Tulips ! 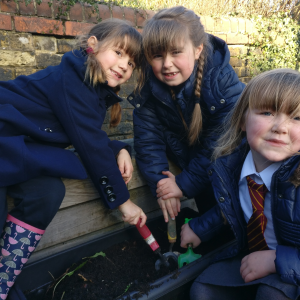 Reception and Year 2 had great fun planting tulip bulbs at the front of the school yesterday. We can’t wait to see how they grow in the Spring ! The Reception and Class1/2 will be having a bedtime story day on the 1st December. Children are encouraged to come to school in their pyjamas and bring along their favourite bedtime story, which they will read throughout the day. Please also send in a monetary donation from £1 upwards. Our Christmas singalong/carol service will take place at St John the Evangelist church from 6.30-7.30pm on Wednesday 13th December. Please put the date in your diary and invite family and friends to come along. All money raised will be used to buy resources for our children. Reception, Year 1 and Year 2 took part in a PANTS assembly about how they can keep themselves safe. There is a lot of great information for parents, including how children can keep themselves safe online, on their website : nspcc.org.uk. Don’t forget to return your forms, even if you are not giving permission for your child to have the vaccine. This helps the nurses to keep a track of which children they need to vaccinate. Vaccinations will take place on Tuesday 5th December in the afternoon. Just a gentle reminder that the next deposit of £55 is due by the end of January. The total cost of the residential in £310. Please bring your payment card in for Mrs Wakeman to sign each time you make a payment for Kingswood on sQuid. Please read the new medicines policy which is now on the website. It contains important information on which medicines we can administer in school. Thank you for all your support for Children in Need. We raised a grand total of £264.90. Well done to the fundraising committee for all their hard work ! Reception- Charlie Lockwood, for sharing and playing nicely with his friends and Lily Nicholls, for an excellent effort during phonics. Class 1&2- Ella Murch, for being successful in Maths by persevering when finding things tricky. Class 3&4- Jack Wallis, for working very hard on his reading and writing all week. Class 5&6- Imogen Snell, for picking up the pace in her writing. Elena Marshall, Michelle Onifade, Bonny-Blu Kedadi, Maansi Chagger and Zachary Teshola. Reception- Evie Parrish, for re-telling the story of The Gingerbread Man in great detail. Class 1&2- Katie Snow, for her fabulous character description of Mrs Armitage. Class 3&4- Milo Shorter, for excellent work solving ‘Barvember’ problems. Class 5&6- Bonny-Blu Kedadi, for mature and detailed storytelling in a sustained piece of writing. Alicia Moran, for achieving her level 3 swimming award and 10m certificate. This is fantastic, class 3&4. Keep it up!